Warp (also known as Warp Records) is an English independent record label, founded in Sheffield in 1989 by record store workers Steve Beckett, Rob Mitchell and record producer Robert Gordon. It is currently based in London. In the 1990s, the label became associated with experimental electronic styles such as Intelligent Dance Music, and served as the home of a variety of acclaimed and influential electronic musicians, including Aphex Twin, Boards Of Canada, LFO, Black Dog, and Autechre. Current artists on the label roster include Flying Lotus, Rustie, Oneohtrix Point Never, Danny Brown, Grizzly Bear, Brian Eno, TNGHT, and Kelela. 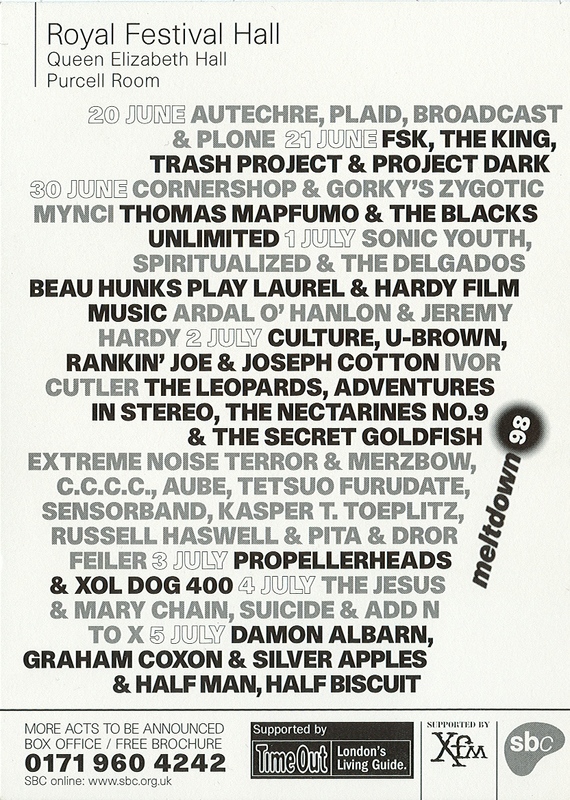 In June 1998, the opening night of the Meltdown festival curated by Peel was a Warp label live special featuring Autechre, Broadcast, Plaid and Plone. The DJ closely followed the evolution of the Sheffield label from early “bleep techno” 12-inch dance singles from outfits such as LFO and Nightmares On Wax to a wider range of experimental electronic music more for home listening, including releases by session artists Aphex Twin and Boards Of Canada. Warp initially tapped into two areas that interested Peel: the local Sheffield tradition of electronic music and the northern club music explosion of the late 1980s from both sides of the Pennines. The first album released by the label was by Sweet Exorcist, who featured Richard H. Kirk of Peel session veterans Cabaret Voltaire. It subsequently worked with other electronic music artists long championed by the DJ, including Alex Paterson (of the Orb) and Brian Eno. Outside Warp's usual parameters, Peel also gave airtime to releases on indie subsidiary label Gift, including early 90s singles from Sheffield session stalwarts Pulp, before the band signed for Island. Warp artists who recorded Peel sessions. List includes sessions when the artists were not on Warp. 30 June 1998: Warp label live special recorded at Meltdown, 1998-06-20, featuring Autechre, Broadcast, Plaid and Plone. 20 April 2000: Luke Vibert (& BJ Cole), live DJ set from Scala, Kings Cross. According to The Festive Fifty by Mark Whitby (1st edition, 2005, pg195), Warp had the joint 19th most Festive Fifty entries of any label in Peel's lifetime (with 13, level with Big Cat and Reception), and the 18th highest number of separate tracks (13, one behind Cog-Sinister, Duophonic and Probe Plus). The list below covers Festive Fifty entries on Warp; it does not include entries by Warp artists on other labels. Please add further information if known. Peel Compilations: A Warp Peel sessions compilation was released in Japan by Associated Records. ↑ The Warp night was on 1998-06-20 (Independent newspaper review). Selections were broadcast on Peel's show of 30 June 1998. The event came shortly after the release of the label compilation We Are Reasonable People (Warp 100), which featured all four artists. ↑ Paterson appeared on the 1992 Warp compilation ‘Artificial Intelligence’ with the track ‘Loving You Live’. Eno has been with the label since the 2010 album ‘Small Craft On A Milk Sea’. ↑ The first Warp release, 'Track With No Name' by the Forgemasters, was played by Peel on 25 January 1990. ↑ Alex Paterson did five sessions with the Orb from 1989 to 1997, while Richard H. Kirk of Sweet Exorcist did two with Cabaret Voltaire, in 1981 and 1984. Brian Eno, who didn't record for Warp until after the death of Peel, did one solo session in 1974, five with Roxy Music and one as a member of Fripp & Eno.